Go to the User Group settings located under the General Settingstab in the Smartlaunch Server settings. Specify a name to the user group. In this case we make a group called VIP members. Choose the Pricing structure you want to use. To learn more about Pricing Structures, see this guide. Choose an Application profile for the user group. The default application profile includes all games and programs. Choose a Security profile for the user group or leave it as default. To learn about setting up Profiles, see this guide. Choose Offer required to join to choose specific offer you can offer to your customers to allow them to join a certain usergroup. 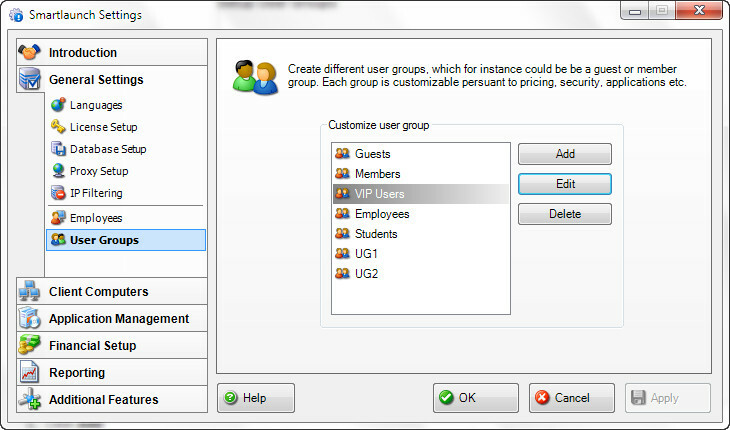 The Guest users checkbox allows you to specify whether guest accounts should be allowed within this user group. The After user logout checkbox allows you to specify whether or not the account should be locked after the user logs out. If this setting is on, when the user logs out they won’t be able to access a computer until their account has been unlocked. Next, you have the option to decide what should happen to users when they are out of time. 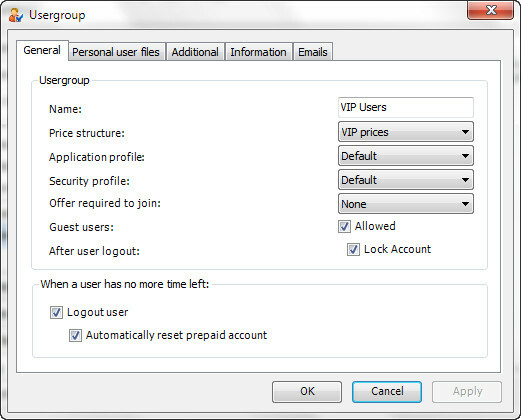 If you choose to Logout user, the user will be automatically logged out of the computer. You can also choose whether or not to have the prepaid account reset. In the Personal User Files tab, You can choose which PUF there should be available in the user group. You can for instance decide, that your normal members dont get any of their PUF stored. Allowing you to choose the user group to which a user of this group is moved to when the membership expires, and specific the number of days that the membership lasts. Set a credit limit. Setting a credit limit allows define the maximum amount of credit allowable on a account within the user group. So if a max credit of $50.00 is set, when a customer reached this limit they will disallowed from logging in. You can also check if you dont want the credit limit to be changeable individually or to be managed at the group level. The Client Settings section allows you to give the option for customers to order products directly from a client computer. You can also choose whether or not to display the logout button of the clients. The Information tab information you want collected from your customers when they create their user account. Signup Email. When a new account is created, you can choose to send an email automatically to the account email on file. You can choose Email to send from the dropdown list. Membership Expiration Email. This setting allows to send an email when user membership expires. You can also set the number of days that the email is set prior to expiration. Emails can be created in the Reporting -> Email Editing setting in the Smartlaunch server.